Starting: Each player takes 7 dominoes. Randomly select the first player. A player plays one domino per turn. The first tile played will start the first avenue. The second tile played must extend that avenue. Domino numbers must be matched to all bordering dominoes in order to be played. Avenues: Dominoes played in a north to south direction are called avenues. These dominoes are placed end to end. An avenue must border at least one other domino (See diagrams below). An avenue's length is set when 7 dominoes are placed in an avenue. These 7 need not all be connected; it is possible that there be a "northern" and "southern" part of an avenue. After the seventh domino is placed, the avenue may not grow any further north or south, but if there are gaps dominoes can be added in the gaps. It may help to place a token (a coin) on avenues that have reached their maximum length. Streets are made by placing a domino perpendicular to an avenue. A street must touch at least 2 avenue dominoes. No street ever touches another street. 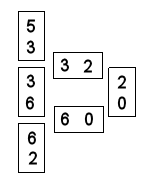 A point is scored when a domino is placed that closes off a block. Such a block may be bordered by 1 domino on each side, or may be larger. If a domino is placed inside a block and divides a block in two, two blocks have been created and two points are scored. If a player cannot legally play a tile, he must pass. He may choose to discard a domino and draw a new domino. Avenue is vertical,streets are horizontal. Notice there is one completed block. Note that tile 6-0 is not played correctly; 6-0 only borders one avenue tile. The avenue ending with 3-6 needs to be extended one more tile before a street can be formed. 1-2 is placed correctly; new avenues need only border one street. A tile can be placed connecting 5 and 1 at the top of the diagram; that tile would border two avenue tiles. The black domino is correctly placed. It is connected to 2 avenue dominoes (north/south). It also completes an irregularly shaped block. The blue domino cannot be played; it is only connected to one avenue domino. Notice that the center avenue contains seven dominoes. It cannot be extended further north or south, however, a domino may be played in the middle.